If you buy organic food… A lot of the produce is ORGANIC! Some folks shop for organic food online, but much of the food available at the farmer’s market is organic – and WAY less expensive. You’ll pay through the nose for organic produce at most organic food stores like Whole Foods. At local farmer’s markets, you get high-quality, fresh produce at a fraction of the price AND you support local growers. You may be surprised to find that many of the local farmer’s markets have much more to offer than fresh fruit and vegetables. Many sell fresh cut flowers, baked goods, arts and crafts, and even Amish furniture. 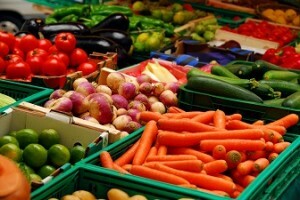 Produce, plants, frozen meats, honey, baked goods, other food & non-food items. Fresh fruit, vegetables, cheese, baked goods, flowers, honey and more! Check out our web site at www.yorkandvallette.com! Over 35 vendors selling fruits, vegetables, cut flowers, perennials, cheese, vinegars & oils, bread/baked goods, mushrooms, spices,frozen organic meat, jewelry, arts and crafts. Fresh fruit and vegetables, meat, cheese, flowers, honey, baked goods, flowers and more! 32 year old market in heart of downtown business district includes fruits, vegetables, organic produce, greenhouse plants, freshcut flowers, cheese, bakery, flavored oils & vinegars. Welcome to our fiftheseason! We have grown to be a regular stop on Saturday mornings for Roselle residents, as well as for those from many surrounding communities. This event has the heart of a farmer’s market with fresh fruit, vegetables, flowers and baked breads. There is also a broad array of unique gourmet and gift items that entice shoppers to come back week after week. Come do your shopping, feast on a hearty homemade breakfast platter and enjoy the live entertainment each Saturday. 2nd year Farmers Market in downtown Warrenville open to Growers, Producers, Craftpersons, Artists, and local non-profit orgnizations. Certificate of Insurance required. For more information, visit our website at www.warrenvilleparks.org. I am looking to set up a booth for stepping stones at Farmer’s Markets. You can reach me at (630) 521-9488 or (815) 671-1970. « DuPage County Fair’s Future in Question?